A brilliant leap forward and undoubtedly the next industry standard, whether you like it or not. New 6.1-inch screen. Touch-sensitive needle search function. 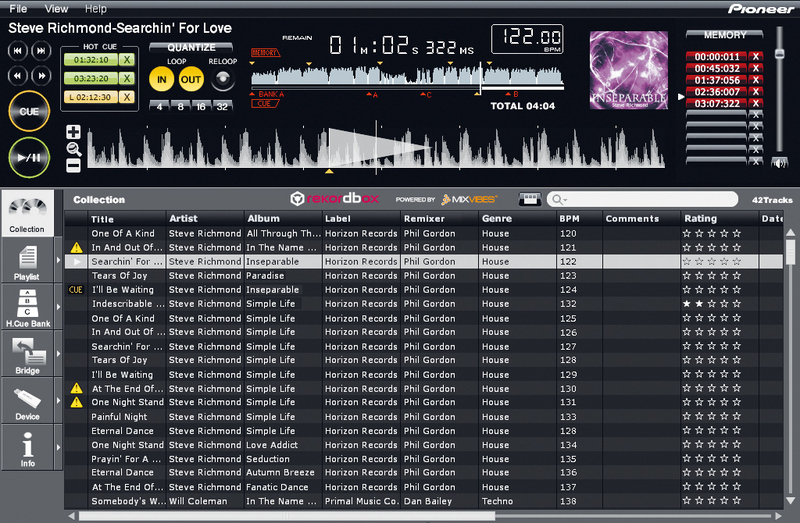 Rekordbox software. Pioneer made its first major stamp in clubland in 2001 with the CDJ-1000, and steadily the 1000s have become the industry standard DJ device. There have been the updates to the CDJ-1000 design with the MkI and MkII versions, but with laptops becoming more and more popular in the clubs, it seemed that Pioneer was in need of something special to keep it on top. So this is its answer - a fully-fledged digital media player, retaining the robust looks and feel of the original CDJ while providing all the connectivity and modern features that the new generation of DJs demands. The first thing that strikes you when you take the CDJ-2000 out of its packaging is the sheer size of the unit - it's more comparable to larger Pioneer's DVJ device. The size increase is mainly due to the huge WQVGA screen (480 x 234) which has been included without compromising on standard button sizes or, indeed, the size of the platter. Inside, the unit has been improved with a brand new Wolfson DAC processor that when hooked up digitally to a mixer does sound better at high volume levels that the CDJ-1000. "CDJ-2000's main focus is on managing your digital music library and integrating seamlessly with laptops, MIDI and other new technologies that making their way into the DJ booth." Switching on the unit brings to life the usual backlit buttons but with the added benefit of a backlit jogwheel and huge glowing screen - you're not going to have any problems navigating your way around the CDJ-2000 in a dark club. Plus, if the screens or the jogwheel glow too bright for your taste you can tweak the brightness in the settings page very easily. When it comes to the more exciting new features, the CDJ-2000's main focus is on managing your digital music library and integrating seamlessly with laptops, MIDI and other new technologies that making their way into the DJ booth. The backbone of this is the included Rekordbox software collaboration between Pioneer and MixVibes - a sort of iTunes for DJs. Once installed on your Mac or PC the software enables you to import your MP3 collection (either manually or existing iTunes Libraries and playlists), tag it, set cue and loops points and analyse and prepare your music in a similar manner to when you import tracks into Traktor or other DJ software. This is a breeze, simply dragging tracks into Rekordbox starts the analysing, works out the BPM and allows you to tag tracks and rate your music collection for recall on the CDJ-2000 later. You can colour code your music and add all the ID3 information you might need to help recalling the tracks easier. At the top of the software, you can view the analysed waveform and click it to set hot cue and loop points, which again can be saved on USB key or SD card, allowing any CDJ-2000 or 900 to be able to recall them. In use, this is quite special as it also works in reverse, enabling you to record cue points made when playing live and recall them in Rekordbox later. If you quantise within the CDJ-2000 then the Rekordbox makes loop and cue points snap to the nearest transient, making beat-perfect loops and drops becomes easy. Working with Rekordbox also means that when tracks are exported to a USB key or SD card, they will load much faster on the CDJ-2000 than if the key was loaded with MP3s that were drag and dropped. That said, we were able to plug a 120GB hard drive full of MP3s that had not been through the Rekordbox software and it worked perfectly well too. One thing that is worth mentioning, though, is that once the drive has been through Rekordbox, you're unable to access other folders that have been drag and dropped onto the same key, so, a hybrid key isn't possible. Finding your tracks from the USB or SD card is simple, thanks to a simple rotary button that can be pressed to navigate between folders and tracks with a back button above. Overall the usability is pretty foolproof and even without the advanced work in Rekordbox, you can happily show up with a hard drive and navigate around its folders easily. A simple but fantastically useful feature is the new Needle Search. This is a touch sensitive strip that runs below the screen, similar to a ribbon controller on a synth. Touching this strip lets you instantly drop on different parts of the loaded track, with real time feedback on the screen. This makes quickly finding cue points so much easier and a clever needle lock feature during playback ensures that there are no accidents. Once you're used to this method, navigating around your waveform is as easy as it is with any DJ software. Other new performance features include a one button four-beat loop, similar to the one found on the CDJ-400. Tapping this initially sets up a four-beat loop, while further taps shorten the loop by half and half again. Initially, it was difficult to figure out how to increase the loop from a shortened two-beat loop back to the original four-beat loop again. A trip to the manual explained that by holding the yellow loop out button and tapping the four-beat loop button, the reverse could be achieved, if a little clumsily. One way Pioneer has tried to ensure that it's not pushed out of the DJ booth by laptops and controllers is to embrace the software revolution. The CDJ-2000s work with Traktor, Serato and MixVibes Cross2 using the HID protocol. This means that these applications can be controlled without any extra equipment. Testing this feature out with Traktor was fantastic, with the Pioneer jumping into link mode at the push of a rotary controller and Traktor quickly finding the CDJ-2000 as an interface and HID controller. Once connected, you are able to assign the CDJ-2000 to a deck in Traktor. The mapping controls are obvious and the 'feel' of DJing like this is exactly the same as when using CDs. Probably the coolest feature is that track information is pulled from Traktor onto the screen and you can navigate around your Traktor browser, selecting new tracks using the controls on the CDJ. It did make us wonder if we'll see more information being pulled though from Traktor in future updates. 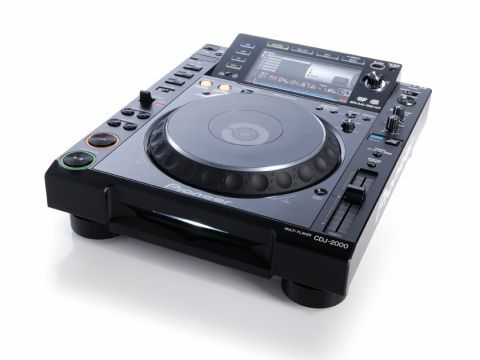 The addition of an Ethernet port and Pioneer's Pro DJ Link technology means that now up to four CDJ-2000s (using an Ethernet hub) can be connected together and will share a connected USB key, hard drive or inserted SD card. This means one large USB key can serve all four decks and DJs can show up to gigs with nothing more than a keyring and some headphones. It's a shame the new link up technology doesn't extend to being able to physically sync tracks like Ableton Live and Traktor can, but it's likely that software and firmware updates for the CDJ-2000 might allow for enhanced communication over Ethernet and USB. The CDJ-2000 has clearly been designed by DJs for DJs and it's very hard to fault. The price is high, though, so it will probably take a while before we see these in the smaller venues. One thing is for sure - if the future of DJing lies in devices like the CDJ-2000, DJs will have to do much more work organising and preparing their music. But to have 10,000 tracks in your pocket, it's probably worth it.